Available internationally through wishtrend.com this lip tint will last you all day. The berrisom Lip tint is essentially a lip gloss mask. Apply it for for 5-10 minutes and then you can then peel off the gloss to reveal the bright colour left behind. It really is as good as it sounds; no need to re-apply during the day! If you suffer with dry feet during the winter season, say hello to baby soft skin with this foot mask. Apply it for your feet for 45 – 60 minutes. Even though you will not see results right away, in 3-5 days your feet will shed away all the dead skin cells leaving behind a soft surface. Sounds gross, but it works! Available internationally at The Face Shop. If you’ve heard of a BB or CC cream, prepare for the next big thing: The CC cushion. 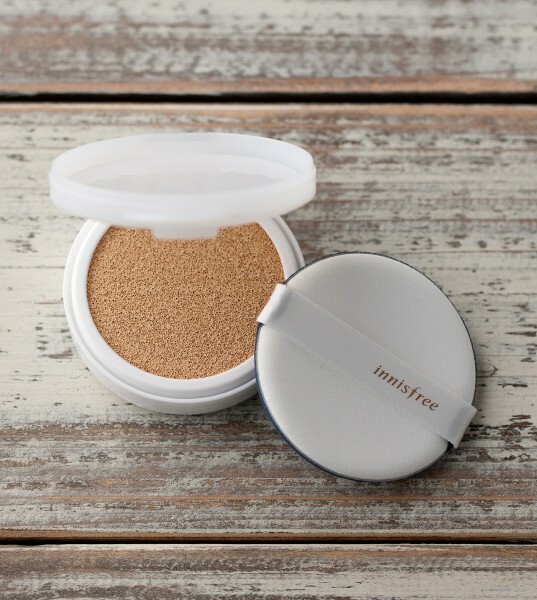 Known for its hydrating and brightening properties the CC cushion brings the CC cream into a compact format. By pressing a puff into the cushion absorbed product, you can pat it into your face for a clear and even complexion. Available internationally on innisfree. Are you using a beauty product that is found abroad? We want to know! Share your beauty tips and tricks with us on Twitter, Facebook or Instagram!